TRUCKS WERE waiting on a queue outside VanDyke’s Supply Monday, as workers loaded up the entire contents of three of the company’s divisions. Trucks arrived shortly after around 30 employees were told their jobs had been moved to North Carolina. No one knew when they arrived to work at VanDyke’s Monday morning that within minutes their lives would be immediately changed. A few employees noticed the “fancy cars” in the parking lot lined up in the front row all bearing out-of-state plates. It wasn’t typical for a Monday morning, or for a normal periodic visit from the heads of the company. Employee of 19 years, Amy Miiller knew her life was about to change when her boss met her at the door with a clipboard of names. As they walked in the door, some were told to go into a break room, Miiller was told to go into the other meeting room. Dave Sachs, CEO of McKenzie Taxidermy Supply, and five other heads of VanDykes’ parent company out of Granite Quarry, N.C., stood at the front of the big meeting room as Miiller and an estimated 25-30 of her coworkers filed in. The meeting was short and sweet. According to Miiller, Sachs made a claim that in the seven years the company had owned VanDyke’s, McKenzie had invested $2 million dollars and sales had decreased 50 percent. She says he addressed the group as if the individual employees were personally responsible for this apparent loss. He went on to say that due to this decrease in sales, the company could no longer afford to continue employing the number of people currently there, and that three divisions of the company would be immediately moved to their North Carolina plant: chemical, wood and foam. Trucks were already lining up outside, and McKenzie had brought with them workers to clean out the plant and get the trucks loaded. “Well, it’s over,” said another former employee. “The plant is closed,” he said, not knowing what had happened in the other break room and believing that, regardless, this was the end for VanDyke’s Supply, a 67-year-old Woonsocket company. VanDyke’s Supply was founded in 1949 by the VanDyke family and has remained in Woonsocket, employing thousands throughout the years. The family sold the company to Cabela’s near the end of the ‘90s, who then sold the taxidermy portion to McKenzie Sports Products in 2009. McKenzie is based in Granite Quarry, but has distribution centers all over the country. Apparently, much of the glass eye division remains employed for the time being, along with welding and shipping, until there is nothing left at the plant to ship out. It is believed that these positions may remain until early next year, when a final round of layoffs will take place. …To read more, pick up this week’s issue of the Sanborn Weekly Journal. 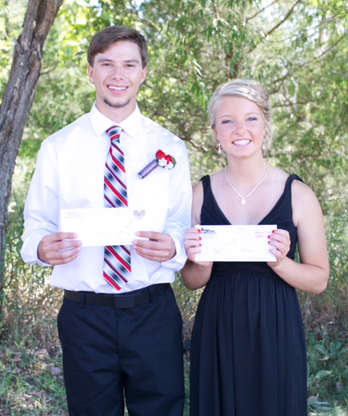 TOM HETLAND and Bailey Moody with their scholarship checks, made possible by Hegg Insrance and Farm Mutual Insurance. Tom Hetland, son of Rob and Jane Hetland of Artesian, was a $500 South Dakota Association of Mutual Insurance Companies educational scholarship winner. Bailey Moody, daughter of Perry and Tracey Moody of Letcher, was a $250 SDAMIC Alan Hewitt memorial scholarship winner. Scholarship winners were announced at the annual SDAMIC convention in Chamberlain in August. Hetland and Moody are insureds of Hegg Insurance and Farm Mutual Insurance Company of Lincoln County. A pickup caught fire on SD Highway 34 about six miles east of Woonsocket, Sunday afternoon. The Woonsocket Fire Department and the Sanborn County Sheriff’s office responded to the fire at about 1 p.m. Crystal McIntosh of Wessington Springs was the driver of the 1989 Ford.